Simply select the amount and send your gift card on its way! When a customer places an order for an E-Gift card, an email with a gift card number and an image of your gift card is emailed to the recipient (delivery time rarely exceeds 15 minutes, but can take up to 2 hours to process). Physical gift cards are plastic cards that are shipped to the recipients; usually shipped out in 24-48 hours. Each gift card will be activated for the amount requested and mailed to the recipient in a professionally designed card presenter, mailed by the carrier selected at checkout. E-Gift Cards are delivered quickly (delivery time rarely exceeds 15 minutes, but can take up to 2 hours to process). Physical Gift Cards are usually ship next day. Choose the shipping method at the checkout for different delivery service. To activate your ATees Gift Card, please register for an ATees.com account. You may register here. After registration, use the E-Card code or Physical Card code, enter the code in the shopping cart page. The code can be entered in the coupon code/gift card box at the Coupon/Gift Card section of the shopping cart page. Note you must be logged in to activate the code. Once you've entered the E-Card code or Physical Card code, the whole amount of the gift card is automatically added to the account you are logged in with in the form of store credit. You can check the balance of your new store credit in your account or at the Store Credit section of the shopping cart. Note: The code will only be activated once. Please make sure to log into your account to activate the E-Card code or Physical Card code. Once the Gift Card amount is added to a particular account, the Gift Card will be deactivated. ATees.com Gift Cards must be redeemed toward the purchase of eligible products on www.ATees.com. Purchases are deducted from the ATees.com store credit balance. Any unused balance will be remained in the recipient's ATees.com member account. 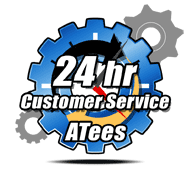 If an order exceeds the amount of the ATees.com Gift Card, the balance must be paid with a credit card or other available payment method. ATees.com may provide Gift Card purchasers with information about the redemption status of ATees.com Gift Cards that they purchase. To view ATees.com store credit balances, visit "My Account" on ATees.com. ATees.com Gift Cards cannot be used to purchase other gift cards. ATees.com Gift Cards cannot be reloaded, resold, transferred for value, redeemed for cash or applied to any other account, except to the extent required by law. Unused ATees.com Gift Card store credit balances in an ATees account may not be transferred. Gift Card balances cannot be refunded back to cash. Discount do not apply to purchase of Gift Cards. Any purchases made with store credit balances that qualifies for refund will be refunded with store credit. The risk of loss and title for ATees.com Gift Cards pass to the purchaser upon our electronic transmission to the purchaser, recipient or delivery to the carrier, whichever is applicable. We are not responsible if an ATees.com Gift Card is lost, stolen, destroyed or used without your permission. ATees.com will have the right to close customer accounts and bill alternative forms of payment if a fraudulently obtained ATees.com Gift Card is redeemed and/or used to make purchases on ATees.com. Any dispute relating in any way to ATees.com Gift Cards in which the aggregate total claim for relief sought on behalf of one or more parties exceeds $300 USD shall be adjudicated in any state or federal court in Hong Kong. When you purchase, receive or redeem an ATees.com Gift Card, you agree that the laws of Hong Kong, without regard to principles of conflict of laws, will govern these ATees.com Gift Card terms and conditions. All terms and conditions are applicable to the extent permitted by law.